Home › Pix of the Trade › Special treat! It’s not every day when a top chef from Jamaica delivers jerk chicken to your office! Agents from Carlson Wagonlit Travel on Merivale Road in Nepean, Ont. 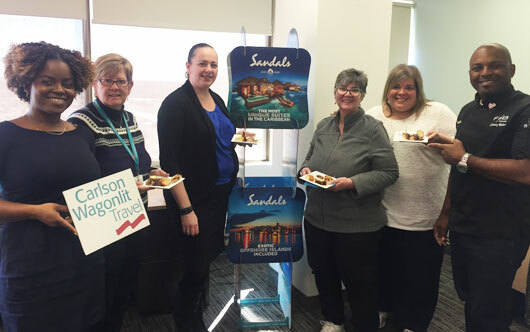 enjoyed a tasty treat this week when Glenroy Walker, Group Senior Executive Chef for Sandals Resorts International dropped in with a jerk chicken lunch, along with Giselle Williams, business development vanager, Ontario, Unique Vacations Canada (pictured far left). Chef Walker, based at Sandals’ corporate office in Montego Bay, is in Ottawa to participate in the Jamaican Gastronomy Festival at the Sheraton Ottawa Hotel, held in partnership with the Jamaican High Commission and the Jamaica Tourist Board (March 21-23).